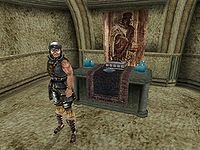 The Talos Cult is a group of worshippers of the great Tiber Septim, founder of the Third Empire. In order to join, new recruits swear an oath to give up their lives in attempting to put a strong man back on the throne of Tamriel. They have many followers in the Legions, conspiring to assassinate whoever the current emperor may be and replace him to prevent the Empire's decline. Esta página foi modificada pela última vez à(s) 22h21min de 1 de janeiro de 2014.